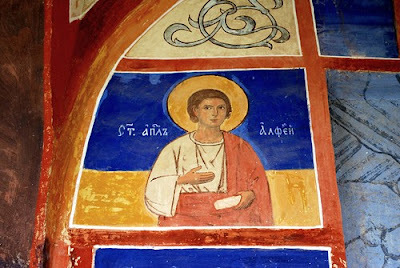 The Holy Apostle Alphaeus of the Seventy appears to have come from the Galilean city of Capernaum. In the Gospels, Alphaeus could refer to either one or two people, as he is separately only mentioned as being the father of the Apostle Matthew (Mk. 2:14) and the father of the Apostle James the Less (Mk. 3:18; Matt. 10:3), both of whom were among the Twelve Disciples. Though both Matthew and James are described as being the "son of Alphaeus" there is no Biblical account of the two being called brothers, in the same context where John and James or Peter and Andrew are described as being brothers. However, the Alphaeus commemorated today is said to be the father of a son named Abercius and a daughter named Helen, thus adding to the mystery of the identity of who exactly this Alphaeus commemorated today is. For this reason it has been proposed that Alphaeus here mentioned is in fact James the Less or Matthew, added in the calendar today as a second commemoration or associated with a separate local tradition. 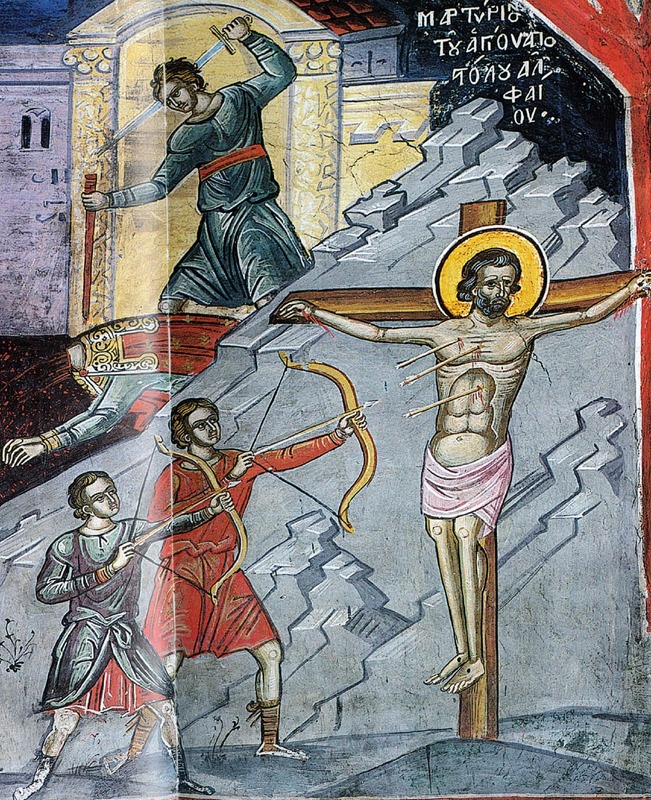 As for Abercius, he is said to have been martyred by being spread out naked and stung by bees till he died. 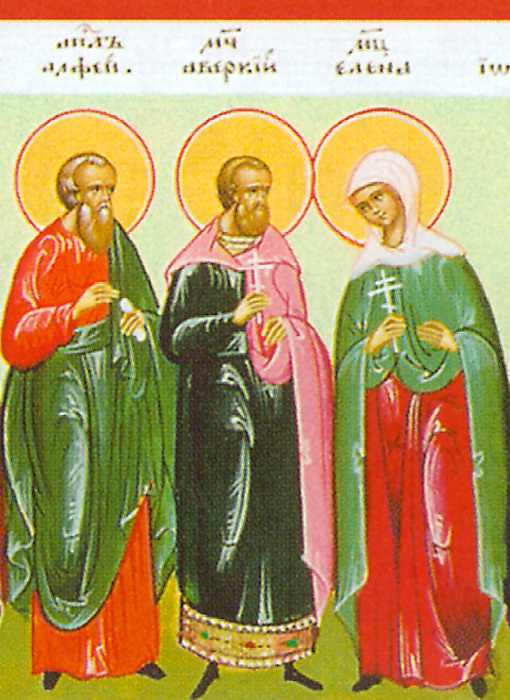 Helen was martyred by being stoned to death. 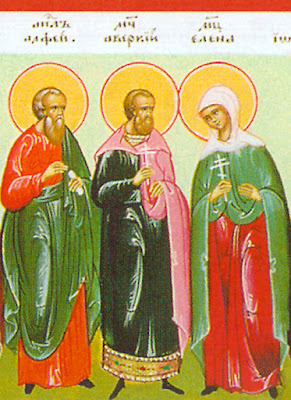 * According to the surviving fragments, which may be spurious, of the work Exposition of the Sayings of the Lord by Papias of Hierapolis, who lived c. 70–163 AD, Cleopas and Alphaeus are the same person: "Mary the wife of Cleopas or Alphaeus, who was the mother of James the bishop and apostle, and of Simon and Thaddeus, and of one Joseph [Joses]." The Catholic Encyclopedia suggests that etymologically, the names Cleopas and Alphaeus are different, but that they could still be the same person. Other sources propose that Alphaeus, Clophas and Cleophas are variant attempts to render the Aramaic H in Aramaic Hilfai into Greek as aspirated, or K.
** Perhaps he was not an apostle at all, but a later martyr with his two children who happened to have a Hebrew name that was associated with the father of one or two of the Twelve Disciples. But this is just speculation.